Layer this stunning retro salad in a clear bowl to showcase its colourful layers. 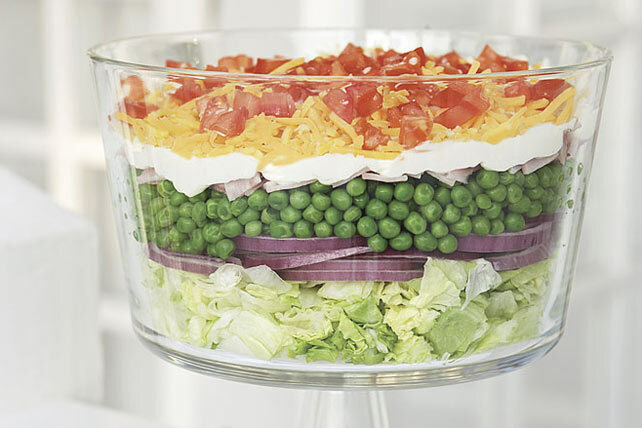 Layer lettuce, onions, peas and ham in large clear straight-sided serving bowl. Mix Miracle Whip and Parmesan; spread over salad to seal. Refrigerate several hours. Top with shredded cheese and tomatoes just before serving; mix lightly. Substitute 8 slices crumbled cooked bacon for the ham.